Sydney Mardi Gras 2019 is set to be one of the biggest yet with parties and parades galore in this stunning Australian city. Enjoy luxury accommodation and build your tailor-made itinerary for Sydney Mardi Gras 2019 with us. We have access to the best rates and flights and arrange your trip to include everything the country has to offer. If you want to explore the country further simply enquire now and we’ll get to designing the perfect itinerary for your trip to Sydney Mardi Gras 2019. When is Sydney Mardi Gras 2019? The Sydney Mardi Gras parade will be held on 2nd March 2019. Build your bespoke trip to Sydney Mardi Gras 2019 with Out Of Office. With access to the best rates and luxury properties in Sydney, we can arrange your entire trip down under for this year’s Mardi Gras in Sydney. Enjoy the colourful parade on in early March as well as the build up as the city comes alive with parties and fun galore. There are a host of events taking place and whilst you’re in the country you will want to enjoy the best that Australia has to offer from wildlife to its beautiful beaches to the stunning scenery and nature. There are an abundance of choices of stunning accommodation in Sydney. From the 4* Cambridge Hotel on Oxford Street to the luxury properties like the Langham and Shangri-La, you’ll find Sydney Mardi Gras 2018 hotels easy to come by if you book early. We can arrange a guide and driver for the day for you to enjoy Sydney the way you want. We’ll build a bespoke itinerary for you to enjoy the best that this incredible city has to offer. See the real Australia! Get away from the hustle and bustle of the city and experience the open paddocks, dams and Australian bush at one of Sydney’s most stunning regions. Travel over the Sydney Harbour Bridge. Visit an Orchard and enjoy a tractor ride through the orchards, listening to how the fruit is grown and taste Australian Honey. Cruise Sydney Harbour aboard the prestigious MV Sydney 2000 and enjoy a fantastic buffet lunch and commentary. The afternoon half day Downtown Sydney, Bondi and Kings Cross Tour is a perfect option for those who have a tight schedule or those who don’t wish to be on tour for a full day. This tour is a thorough introduction to Sydney and its neighbours. Tour through the historic Rocks area and take in views of the Opera House, Hyde Park, St Mary’s Cathedral, Parliament House and the Art Gallery. Stop at Mrs Macquarie’s Chair for magnificent views of the Opera House and Harbour Bridge. Visit The Gap and enjoy stunning views. Stop at the world-famous Bondi Beach and enjoy the spectacular scenery. Join the coach for your return to Sydney, travelling through Paddington and the exclusive Eastern suburbs. 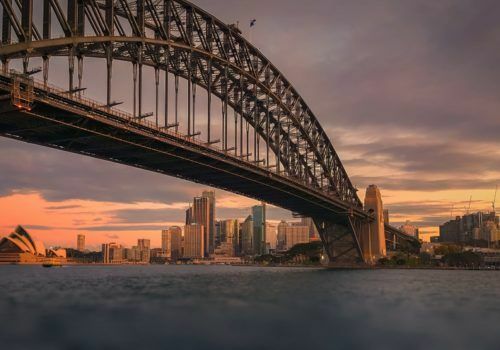 Rise early and choose to climb the bridge before dawn and watch as the sun rises over the beautiful Sydney Harbour. You can also opt for a Day Climb and a Night Climb. THIS IS JUST A SAMPLE OF THE ACTIVITIES WE CAN OFFER. ASK US FOR MORE.